Our monthly topic will follow our short annual meeting of the members. As Apple products become more popular, there are those individuals or groups who will try and profit or initiate security scams on your device in an attempt to make money. Though there are no known Apple viruses, there have been some recent Adware web browser hijacking, phishing emails to access your AppleID, as well as a few ongoing fake “utility” software for your Mac. 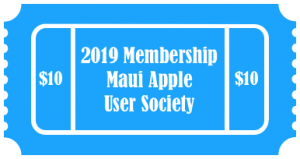 Join us this month as we address ways to protect your Mac and iOS devices as well as some basic security measures you can put in place to protect your email as well as your AppleID. As always we will save time for your Mac and iOS questions. For directions to our meetings, click here.